BSE Shareholder Russ Mitten will present information to the MADA Workers Compensation Seminar concerning a Missouri Supreme Court decision issued April 15, 2014, regarding claims for retaliatory discharge under section 287.780 (Templemire v. W & M Welding, Inc.). The seminars are designed to provide what employers “need to know while operating in the ‘jungle’ of employment laws and regulations.” The seminars will take place in Blue Springs on August 13 and October 6, in Columbia on October 7, in St. Louis on October 8, in Cape Girardeau on October 9, and in Springfield on October 10. For more than 20 years Russ Mitten served as chief legal officer and corporate secretary of large public companies in the telecommunications and public utility industries, most recently as Senior Vice President, General Counsel and Secretary of Citizens Communications Company (now Frontier Communications) and prior to that in the legal department of GTE Corporation. His experience spans the full range of business and legal issues encountered by large companies, including mergers, acquisitions, and divestitures; Sarbanes-Oxley and SEC compliance; corporate and securities matters; commercial transactions; labor and employment law; corporate governance; environmental law; and complex litigation. He also has represented clients in proceedings before the FCC, the FERC, and more that 30 state utility regulatory agencies. He is licensed to practice law in Missouri, Texas, Washington, and Hawaii as well as before several federal district courts, courts of appeals, and the United States Supreme Court. 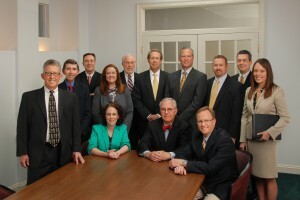 Russ is listed in The Best Lawyers in America in the area of Energy Law, as well as Who’s Who in America.